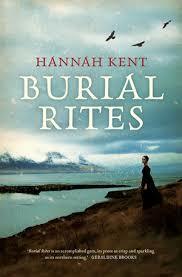 As you may remember from my March Blog Post I was lucky enough to hear Hannah Kent speak about her book, Burial Rites, at the Festival of Golden Words in Tasmania earlier this year. Hannah’s account of the journey that inspired her book – from being an exchange student in Iceland where she originally heard the story, through to her final decision to write about the story years later as part of her Honours, the vigorous research she undertook to tell the story properly, and the rules she set for herself when dealing with the past were such great inspiration for me. She spoke of how important she felt it was to present the story as accurately as possible, to ensure the story stayed true to its Icelandic origins, and did not become some anglicised version. I feel the same with my own story, as I wade my way through the research. As a history of my own land, Van Diemen’s Land, Tasmania, it will not be complete without a mention of the Tasmanian Aborigines, but I am doing more than merely mentioning them; an Aboriginal woman is one of the main characters. But how to present them accurately, when they have been all but wiped from the history records, and little of their culture and beliefs was ever recorded in the first place? But my main purpose for this post is a review for the Australian Women Writer’s Challenge, and so – here are my thoughts on Burial Rites. The book is based on the true story of Agnes Magnusdottir, the last person to be executed in Iceland. Agnes was accused of the murder of Natan Ketilsson, her employer and lover. The story begins with the arrival of Agnes to the farm of a family who are required to house her until her execution. The members of the household, a family of four with two teenage daughters, are hostile towards this intruder, whose presence is forced upon them, and more than a little fearful of having a murderess in the house. Due to the nature of their housing, a dwelling comprising of several storage rooms and one large ‘living’ room, in which everyone, family members, servants, visitors- sleep together, Agnes is literally thrust into the family life, and she takes on the role of servant, contributing to the household in this way. As time passes the barriers between Agnes and the family break-down- first through a memory the older daughter has of meeting with Agnes on a previous occasion, when Agnes gave them two eggs to eat. Agnes also has some knowledge of herbal healing and midwifery, and as she helps the family and their neighbours with ailments and a particularly difficult childbirth, they come to respect her. Beautifully imagined and thoroughly researched, Burial Rites is a tale that grips your heart and your imagination. I could not put the story down, Hannah Kent has managed to present the story of a young woman facing her own death with such realism. Highly recommended read, if you haven’t already.